IAIA is seeking a new IAPA editor; express interest by 31 January. 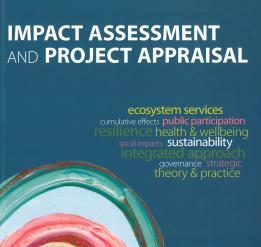 The International Association for Impact Assessment (IAIA) is looking to recruit an editor (or editorial team) for its journal, Impact Assessment & Project Appraisal. If you are an enthusiastic, energetic team player who wants to work with an exceptional group of international experts from across the globe, then we want to hear from you! The details of this position, including the application requirements, can be found here. The new editor (or team) would ideally commence full duties from early to mid-2016. Expressions of interest are due by 31 January 2016.Please direct all questions relating to this call for expressions of interest and submit proposals to IAIA’s Executive Director, Jill Baker.